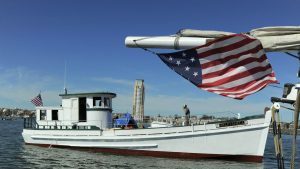 After more than 15 years in Baltimore and Washington, the historic Chesapeake Bay buyboat Half Shell is making her way to Solomons Island. From her new home at No Thyme to Cook (formerly Bowen’s Inn), Half Shell will offer seasonal all-you-can-eat crab feasts and oyster scalds aboard her deck while cruising the scenic Patuxent River. 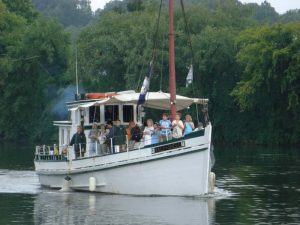 She will also be available for private charters, school groups, weddings, nautical hayrides, scotch & cigar tastings, wine & beer pairings, and much more. Built in 1928 in Perrin, Virginia, the Half Shell has been running environmental education tours with the Living Classrooms Foundation for the last 15 years. Just like the Calvert Marine Museum’s W.B. Tennison, the Half Shell is what’s known as a buyboat. Long before tractor trailers took over their job on land, buyboats would purchase (literally “buy”) oysters and fish from watermen as they were working and bring them into port to sell. In between seafood hauls, they were loaded down with watermelons, tomatoes and pumpkins – making their way up and down the Bay. And as large, open decked boats, they’re the perfect choice for recreational cruises. The Half Shell is U.S. Coast Guard certified, 54’ long, and ready to carry up to 42 passengers. The Half Shell will leave the port of Baltimore for her two-day, 9-hour trip, Friday morning (Nov. 10) with a layover at Herrington Harbor. She will make her way into Solomons harbor Saturday afternoon. If you would like to help support the Half Shell, there is currently a GoFundMe campaign to construct a new pier for the historic vessel. Contributions can be made at https://www.gofundme.com/HalfShell. If you are one of the first 10 people to make a donation of $500 or more (before November 30, 2017), you will be a VIP guest aboard the Half Shell with appetizers and drinks for this year’s lighted boat parade cruise (Saturday, December 2). For more information on the Half Shell or to schedule a private charter, go to https://www.facebook.com/HalfShellAdventures or email info@NoThymeToCook.com.